Here is my translation of the battle of San no Yama-Akatsuka, as related in the Shinchokoki, a record of the Oda clan from 1544 to the death of Oda Nobunaga. 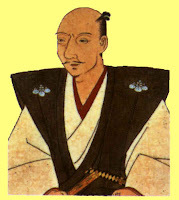 It was written by Ôta Gyûichi, a vassal of Nobunaga and Toyotomi Hideyoshi. The Shinchôkôki is considered a reliable historical account of the events described, and has yet to be translated into English, although excerpts appear in various scholarly works. Akagawa Heishichi of the Oda forces was captured by the enemy. Are you reading a translation of the Shinchôkôki into modern Japanese, or are you translating directly from the classical? just out of curiosity. Great stuff. Yours is a lot cleaner than my translation. I love it. Again, awesome! Basically I was translating the original text, but referring to the modern Japanese translation constantly for reference. I own three different modern copies. Sakakiyama Jun, Kuwada Tadachika, and Nakagawa Taiko modern translation. My opinion, Sakakiyama Jun's is the easiest to understand.